To purchase any of these books please contact Carolyn and tell her which book(s) you would like and she will arrange payment and delivery with you. Fries with That? offers a proven, practical and easy-to-follow weight loss programme together with recipes and the tools to ensure your success. Carolyn's secret? Stop looking for the new miracle and 'just do the damn diet.' Because it works. Christmas recipes that fit in perfectly with your diet. The delicious recipes in The Christmas Table are all part of the Kiwi KISS2 Diet. 27 recipes including: desserts, salads, vegetables, dips and a Christmas cake. Pages and photography are in colour. This is an e-book in PDF format that will be emailed to you. Price: NZ$7.95 + Free Shipping! This little book of 'defining moments' is a collection of thoughts, reflections and stories to help you seize the moment. An integrated exercise and diet programme that really works. Follow this 28-day food and exercise plan as the first step towards creating permanent long-term changes in yourself and your lifestyle. The Dyna-Band® is a safe resistance tool that makes exercise fun and can be tucked in the pocket and taken anywhere. 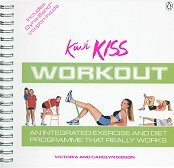 Instructions for use are in The Kiwi KISS Workout. A companion cookbook with 101 new recipes from the best-selling Kiwi KISS Diet.